South Lebanon is a village located in Union, Hamilton and Deerfield Townships in central Warren County in the southwestern part of the U.S. state of Ohio. The population was 4,115 at the 2010 census. South Lebanon was settled in 1795. The village was originally called “Deerfield” because it was the chief settlement of Deerfield Township, Hamilton County, Ohio, but renamed because of its proximity to the county seat of Lebanon. You can receive the Village’s newsletter and important notifications by email by simply clicking here and completing the form. Below is a sample from a recent newsletter. If you have any questions, feel free to contact the Village at jhaddix@southlebanonohio.org. Please be advised that the South Lebanon Mayor’s Court will be held in the new municipal building (10 N. High St. South Lebanon, OH 45065) on January 31st, 2019. Court will begin at 9:00AM. 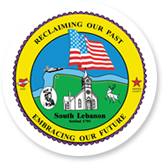 The 2018 Village of South Lebanon Individual Income Tax Return Form is now available. Click below to download the form and instructions. Please contact the Village Tax Office with any questions. The filing deadline is April 15, 2019. Please be advised that the meeting location for the South Lebanon Village Council Meeting scheduled for January 17th, 2019 has been changed from 99 N. High St. to 10 N. High St. South Lebanon Ohio, 45065.